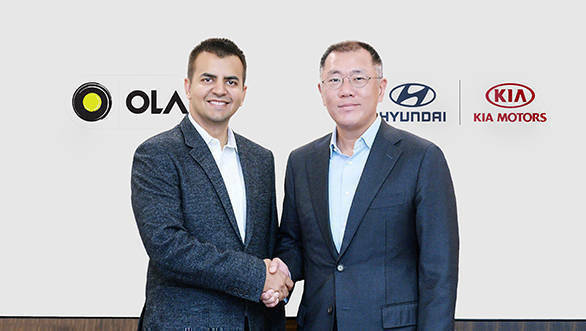 Hyundai Motor Group and Ola announced a strategic partnership under which the Hyundai Motor Company and Kia motors company will make an investment of USD 300 million in Ola to provide smart mobility solutions. The companies will collaborate on developing fleet and mobility solutions and producing India-specific electric vehicles and the necessary infrastructure required. The companies will offer their driver partners with customized vehicles on the Ola platform. Ola drivers will benefit from various financial services, which includes lease and instalment payment schemes. Both the Korean carmakers have agreed on developing cars and fulfil the needs of the ride-hailing market - for both the users and the drivers. The data gathered from the service operation will allow the company to update the vehicles for it to meet local needs. "India is the centerpiece of Hyundai Motor Group's strategy to gain leadership in the global mobility market and our partnership with Ola will certainly accelerate our efforts to transform into a Smart Mobility Solutions Provider," said Euisun Chung, executive vice chairman of Hyundai Motor Group. "Hyundai will proactively respond to market changes and persistently innovate to deliver greater value to our customers."